This article is about NASA's space vehicle. Space Shuttle Atlantis on the launch pad prior to the STS-115 mission. 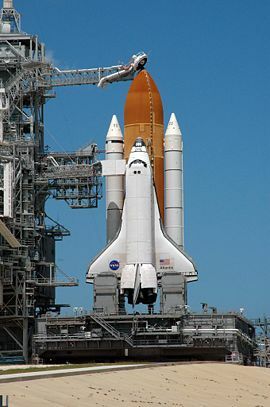 NASA's Space Shuttle, officially called the Space Transportation System (STS), was the United States government's manned launch vehicle from 1981 to 2011. At launch, it consisted of three main assemblies: a reusable Orbiter Vehicle (OV); a large, expendable External Tank (ET); and two relatively slender, partially reusable Solid Rocket Boosters (SRBs). Technically, this entire combination of assemblies is called the "Space Shuttle" (or the "Stack"), although at times the Orbiter alone is referred to as the Space Shuttle. The Shuttle was the first orbital spacecraft designed for partial reusability. The tank and boosters were jettisoned during ascent; only the Orbiter went into space. The vehicle was launched vertically like a conventional rocket, and the orbiter glided to a horizontal landing, after which it could be refurbished for reuse. The Orbiter carried astronauts and payloads such as satellites or space station parts into low earth orbit. It provided crew rotation for the International Space Station (ISS) and performed servicing missions. It was used to return large payloads from the ISS to Earth, as the Russian Soyuz spacecraft has limited capacity for such return payloads. Each Shuttle was designed for a projected lifespan of 100 launches, or 10 years, operational life. The Space Shuttle was retired from service upon the conclusion of the final flight of Atlantis‍ on July 21, 2011. Each Space Shuttle consisted of three main parts: The Orbiter Vehicle, the External Tank, and the two Solid Rocket Boosters (SRBs). The main person responsible for design of the STS was Maxime Faget, who had previously overseen designs of the Mercury, Gemini, and Apollo spacecraft. Normally, five to seven astronauts would ride in the Orbiter, although eight have been carried and eleven could be accommodated in an emergency landing. When the Orbiter's mission is completed, the crew fires its maneuvering thrusters to drop out of orbit and re-enter the Earth's atmosphere. During its descent and landing, the Orbiter acts as a glider and makes a completely unpowered ("dead stick") landing. Five spaceworthy Orbiters have been built, of which three remain. The Orbiter resembles an aircraft with double-delta wings, swept 81° at the inner leading edge and 45° at the outer leading edge. Its vertical stabilizer's leading edge is swept back at a 50° angle. The four elevons, mounted at the trailing edge of the wings, and the rudder/speed brake, attached at the trailing edge of the stabilizer, with the body flap, control the Orbiter during descent and landing. The Orbiter has a large, 60 by 15 ft (18 m by 4.6 m) payload bay, comprising most of the fuselage. The payload capacity is 50,000 pounds (lb) (22,700 kilograms). Three Space Shuttle Main Engines (SSMEs) are mounted on the Orbiter's aft fuselage in a triangular pattern. The three engines can swivel 10.5 degrees up and down and 8.5 degrees from side to side during ascent to change the direction of their thrust and steer the Shuttle as well as push. The orbiter structure is made primarily from aluminum alloy, although the engine thrust structure is made from titanium alloy. The crucial factors in the size and shape of the Orbiter were the requirements that it be able to accommodate the largest planned spy satellites and have the cross-range recovery range to meet classified U.S. Air Force missions. Factors involved in opting for "reusable" solid rockets and an expendable fuel tank included the desire of the Pentagon to obtain a high-capacity payload vehicle for satellite deployment, and the desire of the Nixon administration to reduce the costs of space exploration by developing a spacecraft with reusable components. The first orbiter, Enterprise, was not built for actual space flight but was used only for testing purposes. 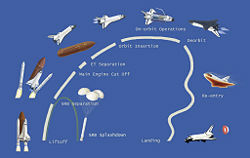 Enterprise was followed by four operational space shuttles: Columbia, Challenger, Discovery, and Atlantis. Challenger was destroyed on launch in 1986, and Endeavor was built as a replacement. Columbia was destroyed on re-entry in 2003. The External Tank (ET) provides approximately 535,000 U.S. gallons (2.025 million liters) of liquid hydrogen and liquid oxygen propellant to the SSMEs. It is discarded 8.5 minutes after launch at an altitude of 60 nautical miles (111 km), and then burns up on re-entry. The ET is constructed mostly of ⅛ inch thick aluminum-lithium alloy. The external tanks of the first two missions were painted white, which added an extra 600 pounds (270 kg) of weight to each ET. Subsequent missions have had unpainted tanks showing the natural orange-brown color of the spray-on foam insulation. The orange-brown color results from ultraviolet light from the Sun striking the foam insulation over time. Two Solid Rocket Boosters (SRBs) each provide 2.8 million lbs of thrust at liftoff, which is 83 percent of the total thrust needed for liftoff. They are jettisoned two minutes after launch at a height of about 150,000 feet (45.7 km), then deploy parachutes and land in the ocean to be recovered. The SRB cases are made of steel about ½ inch (1.27 cm) thick. Structural overview of the Space Shuttle. Early Shuttle missions took along the GRiD Compass, arguably one of the first laptop computers. The Compass sold poorly, because it cost at least $6000, but offered unmatched performance for its weight and size. NASA was one of its main customers. The Shuttle was one of the earliest craft to use a computerized fly-by-wire digital flight control system. This means no mechanical or hydraulic linkages connect the pilot's control stick to the control surfaces or reaction control system thrusters. A primary concern with digital fly-by-wire systems is reliability. Much research went into the Shuttle computer system. The Shuttle uses five identical redundant IBM 32-bit general purpose computers (GPCs), model AP-101, constituting a type of embedded system. Four computers run specialized software called the Primary Avionics Software System (PASS). A fifth backup computer runs separate software called the Backup Flight System (BFS). Collectively, they are called the Data Processing System (DPS). Atlantis deploys its landing gear before landing on a selected runway, in a manner similar to a common aircraft landing. The design goal of the Shuttle's DPS is fail operational/fail safe reliability. After a single failure the Shuttle can continue the mission. After two failures it can land safely. The four general-purpose computers operate essentially in lockstep, checking each other. If one computer fails, the three functioning computers "vote" it out of the system. This isolates it from vehicle control. If a second computer of the three remaining fails, the two functioning computers vote it out. In the rare case of two out of four computers simultaneously failing (a two-two split), one group is picked at random. The Backup Flight System (BFS) is separately developed software running on the fifth computer, used only if the entire four-computer primary system fails. The BFS was created because although the four primary computers are hardware redundant, they all run the same software, so a generic software problem could crash all of them. Embedded system avionic software is developed under totally different conditions from public commercial software, the number of code lines is tiny compared to a public commercial software, changes are only made infrequently and with extensive testing, and many programming and test personnel work on the small amount of computer code. However, in theory it can still fail, and the BFS exists for that contingency. The software for the Shuttle computers is written in a high-level language called HAL/S, somewhat similar to PL/I. It is specifically designed for a real time embedded system environment. The IBM AP-101 computers originally had about 424 kilobytes of magnetic core memory each. The CPU could process about 400,000 instructions per second. They have no hard disk drive and load software from magnetic tape cartridges. In 1990, the original computers were replaced with an upgraded model AP-101S, which has about 2.5 times the memory capacity (about 1 megabyte) and three times the processor speed (about 1.2 million instructions per second). The memory was changed from magnetic core to semiconductor with battery backup. During STS-101, Atlantis was the first Shuttle to fly with a glass cockpit. Internally, the Shuttle remained largely similar to the original design, with the exception of the improved avionics computers. In addition to the computer upgrades, the original vector graphics monochrome cockpit displays were replaced with modern full-color, flat-panel display screens, similar to contemporary airliners like the Boeing 777. This is called a "glass cockpit." In the Apollo-Soyuz Test Project tradition, programmable calculators are carried as well (originally the HP-41C). With the coming of the ISS, the Orbiter's internal airlocks have been replaced with external docking systems to allow for a greater amount of cargo to be stored on the Shuttle's mid-deck during Station resupply missions. The Space Shuttle Main Engines have had several improvements to enhance reliability and power. This explains phrases such as "Main engines throttling up to 104 percent." This does not mean the engines are being run over a safe limit. The 100 percent figure is the original specified power level. During the lengthy development program, Rocketdyne determined the engine was capable of safe reliable operation at 104 percent of the originally specified thrust. They could have rescaled the output number, saying in essence 104 percent is now 100 percent. However, this would have required revising much previous documentation and software, so the 104 percent number was retained. SSME upgrades are denoted as "block numbers," such as block I, block II, and block IIA. The upgrades have improved engine reliability, maintainability and performance. The 109 percent thrust level was finally reached in flight hardware with the Block II engines in 2001. The normal maximum throttle is 104 percent, with 106 percent and 109 percent available for abort emergencies. The three nozzles of the Main Engine cluster with the two OMS pods and the vertical stabilizer above. For the first two missions, STS-1 and STS-2, the external tank was painted white to protect the insulation that covers much of the tank, but improvements and testing showed that it was not required. The weight saved by not painting the tank results in an increase in payload capability to orbit. Additional weight was saved by removing some of the internal "stringers" in the hydrogen tank that proved unnecessary. The resulting "light-weight external tank" has been used on the vast majority of Shuttle missions. STS-91 saw the first flight of the "super light-weight external tank." This version of the tank is made of the 2195 aluminium-lithium alloy. It weighs 7,500 lb (3.4 t) less than the last run of lightweight tanks. As the Shuttle cannot fly unmanned, each of these improvements has been "tested" on operational flights. The SRBs (Solid Rocket Boosters) have undergone improvements as well. Notable is the adding of a third O-ring seal to the joints between the segments, which occurred after the Challenger disaster. Several other SRB improvements were planned in order to improve performance and safety, but never came to be. These culminated in the considerably simpler, lower cost, probably safer, and better performing Advanced Solid Rocket Booster which was to have entered production in the early to mid-1990s to support the Space Station, but was later canceled to save money after the expenditure of $2.2 billion. The loss of the ASRB program forced the development of the Super Light Weight external Tank (SLWT), which provides some of the increased payload capability, while not providing any of the safety improvements. In addition, the Air Force developed their own much lighter single-piece SRB design using a filament-wound system, but this too was canceled. STS-70 was delayed in 1995, when woodpeckers bored holes in the foam insulation of Discovery's external tank. Since then, NASA has installed commercial plastic owl decoys and inflatable owl balloons which must be removed prior to launch. The delicate nature of the foam insulation has been the cause of damage to the tile heat shield and heat wrap of the shuttle during recent launches. NASA remains confident that this damage, while linked to the Columbia space shuttle disaster on February 1, 2003, will not jeopardize the objective of NASA to complete the International Space Station (ISS) in the projected time allotted. A cargo-only, unmanned variant of the Shuttle has been variously proposed and rejected since the 1980s. It is called the Shuttle-C and would trade re-usability for cargo capability with large potential savings from reusing technology developed for the Space Shuttle. On the first four Shuttle missions, astronauts wore modified U.S. Air Force high-altitude full-pressure suits, which included a full-pressure helmet during ascent and descent. From the fifth flight, STS-5, until the loss of Challenger, one-piece light blue nomex flight suits and partial-pressure helmets were worn. A less-bulky, partial-pressure version of the high-altitude pressure suits with a helmet was reinstated when Shuttle flights resumed in 1988. The LES ended its service life in late 1995, and was replaced by the full-pressure Advanced Crew Escape Suit (ACES), which resembles the Gemini space suit worn in the mid-1960s. To extend the duration that Orbiter can stay docked at the ISS, the Station-Shuttle Power Transfer System (SSPTS) was installed. This modification allows Orbiter to use power provided by the ISS and to preserve its consumables onboard. Space Shuttle Challenger's rollout from Orbiter Processing Facility (OPF) to the Vehicle Assembly Building (VAB) to be stacked with External tank and SRB's for launch. (NASA photo). The launching of a shuttle required not only technical and personnel readiness but also appropriate weather conditions. For instance, the shuttle would not be launched under conditions in which it could be struck by lightning. Aircraft are often struck by lightning with no adverse effects because the electricity of the strike is dissipated through its conductive structure and the aircraft is not electrically grounded. Like most jet airliners, the shuttle is constructed mainly of conductive aluminum, which normally protects the internal systems. However, at takeoff, the shuttle sends out a long exhaust plume as it ascends, and this plume can trigger lightning by providing a current path to ground. Although the shuttle might safely endure a lightning strike, a similar strike caused problems on Apollo 12, so for safety, NASA chooses not to launch the shuttle if lightning is possible. Water is released onto the mobile launcher platform on Launch Pad 39A at the start of a rare sound suppression system test in 2004. During launch, 300,000 gallons are poured onto the pad in only 20 seconds. On the day of a launch, after the final hold in the countdown at T minus 9 minutes, the Shuttle goes through its final preparations for launch, and the countdown is automatically controlled by a special computer program at the Launch Control Center known as the Ground Launch Sequencer (GLS), which stops the count if it senses a critical problem with any of the Shuttle's on-board systems. The GLS hands off the count to the Shuttle's on-board computers at T minus 31 seconds. At T-minus 10 seconds, hydrogen igniters are activated under each engine bell to quell the stagnant gas inside the cones before ignition. Failure to burn these gases can trip the onboard sensors and create the possibility of an overpressure and explosion of the vehicle during the firing phase. The main engine turbopumps are also commanded to begin charging the combustion chambers with liquid hydrogen and liquid oxygen at this time. The computers reciprocate this action by allowing the redundant computer systems to begin the firing phase. The three Space Shuttle Main Engines (SSMEs) start at T minus 6.6 seconds. 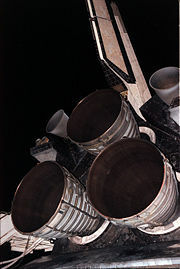 The main engines ignite sequentially via the shuttle's general purpose computers (GPC's) at 0.12 second intervals. The GPC's require that the engines reach 90 percent of their rated performance to complete the final gimbal of the main engine nozzles to liftoff configuration. When the SSMEs start, the water from the sound suppression system flashes into a large volume of steam that shoots southward. 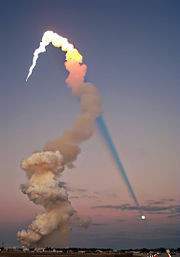 Shuttle launch of Atlantis at sunset in 2001. The sun is behind the camera, and the plume's shadow intersects the moon across the sky. All three SSMEs must reach the required 100 percent thrust within three seconds to initiate the SRB firing command. If the onboard computers verify normal thrust buildup, at T minus 0 seconds, the SRBs are ignited. At this point the vehicle is committed to takeoff, as the SRBs cannot be turned off once ignited. After the SRBs reach a stable thrust ratio, pyrotechnic nuts are detonated by radio controlled signals from the shuttle's GPC's to release the vehicle. The plume from the solid rockets exits the flame trench at near the speed of sound, often causing a rippling of shockwaves along the actual flame and smoke contrails. At ignition, the GPC's mandate the firing sequences via the "Master Events Controller," a computer program integrated with the shuttle's four redundant computer systems. There are extensive emergency procedures (abort modes) to handle various failure scenarios during ascent. Many of these concern SSME failures, since that is the most complex and highly stressed component. After the Challenger disaster, there were extensive upgrades to the abort modes. When watching a launch, look for the "nod" ("twang" in NASA lingo). After the main engines start, but while the solid rocket boosters are still clamped to the pad, the offset thrust from the Shuttle's three main engines causes the entire launch stack (boosters, tank and shuttle) to flex forward, about 2 m at cockpit level. As the boosters flex back to their original position, the launch stack springs slowly back upright. This takes approximately 6 seconds. When it is perfectly vertical, the boosters ignite and the launch commences. Shortly after clearing the tower, the Shuttle begins a "roll-and-pitch" program to set its orbital inclination, and so that the vehicle is below the external tank and SRBs, with wings level. The vehicle climbs in a progressively flattening arc, accelerating as the weight of the SRBs and main tank decrease. To achieve low orbit requires much more horizontal than vertical acceleration. This is not visually obvious since the vehicle rises vertically and is out of sight for most of the horizontal acceleration. The near circular orbital velocity at the 380 km (236 miles) altitude of the International Space Station is 7.68 km per second (27,648 km/h, 17,180 mph), roughly equivalent to Mach 23 at sea level. For missions towards the International Space Station, the shuttle must reach an azimuth of 51.6 degrees inclination to rendezvous with the station. Around a point called "Max Q," where the aerodynamic forces are at their maximum, the main engines are temporarily throttled back to avoid overspeeding and hence overstressing the Shuttle, particularly in vulnerable areas such as the wings. At this point, a phenomenon known as the "Prandtl-Glauert Singularity" occurs, where condensation clouds form during the vehicle's transition to supersonic speed. At 126 seconds after launch, explosive bolts release the SRBs and small separation rockets push them laterally away from the vehicle. The SRBs parachute back to the ocean to be reused. The Shuttle then begins accelerating to orbit on the Space Shuttle main engines. The vehicle at that point in the flight has a thrust to weight ratio of less than one—the main engines actually have insufficient thrust to exceed the force of gravity, and the vertical speed given to it by the SRBs temporarily decreases. However, as the burn continues, the weight of the propellant decreases and the thrust-to-weight ratio exceeds 1 again and the ever-lighter vehicle then continues to accelerate toward orbit. The vehicle continues to climb and takes on a somewhat nose-up angle to the horizon—it uses the main engines to gain and then maintains altitude while it accelerates horizontally towards orbit. At about five and three-quarter minutes into ascent, the orbiter rolls heads up to switch communication links from ground stations to Tracking and Data Relay Satellites. Finally, in the last tens of seconds of the main engine burn, the mass of the vehicle is low enough that the engines must be throttled back to limit vehicle acceleration to 3 g, largely for astronaut comfort. Before complete depletion of propellant, as running dry would destroy the engines, the main engines are shut down. The oxygen supply is terminated before the hydrogen supply, as the SSMEs react unfavorably to other shutdown modes. Liquid oxygen has a tendency to react violently, and supports combustion when it encounters hot engine metal. The external tank is released by firing explosive bolts and falls, largely burning up in the atmosphere, though some fragments fall into the Indian Ocean. The sealing action of the tank plumbing and lack of pressure relief systems on the external tank helps it "break up" in the atmosphere. After the foam burns away during reentry, the heat causes a pressure build-up in the remaining liquid oxygen and hydrogen until the tank explodes. This ensures that any pieces that fall back to Earth are small. To prevent the shuttle from following the external tank back into the atmosphere, the OMS engines are fired to raise the perigee out of the atmosphere. On some missions (such as STS-107 and missions to the ISS), the OMS engines are also used while the main engines are still firing. The reason for putting the orbiter on a path that brings it back to Earth is not just for external tank disposal. It is one of safety; if the OMS malfunctions, or the cargo bay doors cannot open for some reason, the shuttle is already on a path to return to Earth for an emergency abort landing. A computer simulation of the outside of the Shuttle as it heats up to over 1,500 °C during re-entry. Almost the entire Space Shuttle reentry, except for lowering the landing gear and deploying the air data probes, is normally performed under computer control. However, the reentry can be and has (once) been flown entirely manually. The approach and landing phase can be controlled by the autopilot, but is usually hand flown. The vehicle begins reentry by firing the OMS engines, while flying upside down backside first, in the opposite direction to orbital motion for about three minutes giving roughly 200 mph of delta-v. The resultant slowing of the Shuttle lowers its orbital perigee down into the atmosphere. The shuttle flips over by pulling its nose up (which is actually "down" because it's flying upside down). This OMS firing is done roughly halfway around the globe from the landing site. The vehicle starts significantly entering the atmosphere at about 400,000 ft (120 km) at around Mach 25 (8.2 km/s). The vehicle is controlled by a combination of RCS thrusters and control surfaces, to fly at a 40 degree nose-up attitude producing high drag, not only to slow it down to landing speed, but also to reduce reentry heating. In addition, the vehicle needs to bleed off extra speed before reaching the landing site. This is achieved by performing s-curves at up to a 70 degree roll angle. In the lower atmosphere, the Orbiter flies much like a conventional glider, except for a much higher descent rate, over 10,000 feet (3 km) per minute. At approximately Mach 3, two air data probes, located on the left and right sides of the Orbiter's forward lower fuselage, are deployed to sense air pressure related to vehicle's movement in the atmosphere. Discovery touches down at Edwards Air Force Base at the end of STS-114. When the approach and landing phase begins, the Orbiter is at a 10,000-ft (3048 m) altitude, 7.5 miles (12.1 km) from the runway. The pilots apply aerodynamic braking to help slow down the vehicle. The Orbiter's speed is reduced from 424 mph (682 km/h) to approximately 215 mph (346 km/h), (compared to 160 mph for a jet airliner), at touchdown. The landing gear is deployed while the Orbiter is flying at 267 mph (430 km/h). To assist the speed brakes, a 40 ft (12.2 m) drag chute is deployed either after main gear or nose gear touchdown (depending on selected chute deploy mode) at about 213 mph (343 km/h). It is jettisoned as the Orbiter slows through 69 mph (111 km/h). After landing, the vehicle stands on the runway for several minutes to permit the fumes from poisonous hydrazine, used as a propellant for attitude control, to dissipate, and for the shuttle fuselage to cool before the astronauts disembark. Conditions permitting, the Space Shuttle will always land at Kennedy Space Center. However, if the conditions make landing there unfavorable, the Shuttle can touch down at Edwards Air Force Base in California or at other sites around the world. A landing at Edwards means that the shuttle must be mated to the Shuttle Carrier Aircraft and returned to Cape Canaveral, costing NASA an additional 1.7 million dollars. A Space Shuttle (STS-3, Columbia) has also landed once at the White Sands Space Harbor in New Mexico, but this is often a last resort, as NASA scientists believe that the sand could cause damage to the shuttle's exterior. Space Shuttle Atlantis transported by a Boeing 747 Shuttle Carrier Aircraft (SCA), 1998 (NASA). Space Shuttle Endeavour being transported by a Boeing 747. A list of additional landing sites is given below. Crew: Eight (Commander, Pilot, Co-pilot,two Mission Specialists, and three Payload Specialists), two for minimum. Below is a list of major events in the Space Shuttle orbiter fleet. September 17, 1976 Enterprise Prototype Space Shuttle Enterprise was rolled out of its assembly facility in Southern California and displayed before a crowd several thousand strong. February 18, 1977 Enterprise First flight; Attached to Shuttle Carrier Aircraft throughout flight. August 12, 1977 Enterprise First free flight; Tailcone on; lakebed landing. October 26, 1977 Enterprise Final Enterprise free flight; First landing on Edwards AFB concrete runway. January 28, 1986 Challenger Disaster starting 73 seconds after launch; STS-51-L; all seven crew members died. February 1, 2003 Columbia Disintegrated during re-entry; STS-107; all seven crew members died. 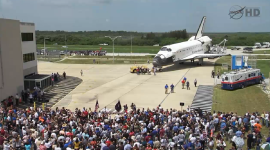 Atlantis orbiter's final welcome home, 2011. NASA retired the Space Shuttle in 2011, after 30 years of service. 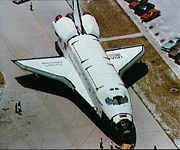 The Shuttle was originally conceived of and presented to the public as a "Space Truck", which would, among other things, be used to build a United States space station in low earth orbit in the early 1990s. When the US space station evolved into the International Space Station project, which suffered from long delays and design changes before it could be completed, the service life of the Space Shuttle was extended several times until 2011, serving at least 15 years longer than it was originally designed to do. Discovery was the first of NASA's three remaining operational Space Shuttles to be retired. The final Space Shuttle mission was originally scheduled for late 2010, but the program was later extended to July 2011 when Michael Suffredini of the ISS program said that one additional trip was needed in 2011 to deliver parts to the International Space Station. The Shuttle's final mission consisted of just four astronauts—Christopher Ferguson (Commander), Douglas Hurley (Pilot), Sandra Magnus (Mission Specialist 1), and Rex Walheim (Mission Specialist 2); they conducted the 135th and last space Shuttle mission on board Atlantis, which launched on July 8, 2011, and landed safely at the Kennedy Space Center on July 21, 2011, at 5:57 AM EDT (09:57 UTC). Atlantis is on display at the Kennedy Space Center Visitor Complex, near Cape Canaveral, Florida. It was delivered to the Visitor Complex on November 2, 2012. Discovery was delivered to the Udvar-Hazy Center of the Smithsonian Institution's National Air and Space Museum in Chantilly, Virginia, near Washington, D.C. on April 19, 2012. On April 17, 2012, Discovery was flown atop a 747 Shuttle Carrier Aircraft escorted by a NASA T-38 Talon chase aircraft in a final farewell flight. The 747 and Discovery flew over Washington, D.C. and the metropolitan area around 10 am and arrived at Dulles around 11 am. The flyover and landing were widely covered on national news media. Endeavour was delivered to the California Science Center in Los Angeles, California on October 14, 2012. It arrived at Los Angeles International Airport on September 21, 2012, concluding a two-day, cross country journey atop the Shuttle Carrier Aircraft after stops at Ellington Field in Houston, Biggs Army Airfield in El Paso and the Dryden Flight Research Facility at Edwards Air Force Base, California. Enterprise (atmospheric test orbiter) was on display at the National Air and Space Museum's Udvar-Hazy Center but was moved to New York City's Intrepid Sea-Air-Space Museum in mid-2012. ↑ Irene Klotz, NASA shuttle tank an eyesore but ready to fly. Retrieved August 10, 2007. ↑ pages.total.net, GRiD Compass 1101. Retrieved August 10, 2007. 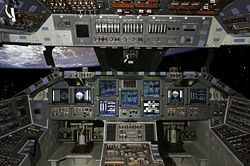 ↑ Roscoe C. Ferguson, Robert Tate, and Hiram C. Thompson, Implementing Space Shuttle Data Processing System Concepts in Programmable Logic Devices. Retrieved August 10, 2007. ↑ Jim Dumoulin, Woodpeckers damage STS-70 External Tank. Retrieved August 10, 2007. ↑ NASA, NASA—Countdown 101. Retrieved August 10, 2007. ↑ NASA, Hold-Down Posts. Retrieved November 22, 2007. ↑ Mike Wall, 35 Years Ago: NASA Unveils First Space Shuttle, 'Enterprise' Yahoo! News, September 17, 2011. Retrieved October 13, 2015. ↑ NASA Updates Shuttle Target Launch Dates For Final Two Flights NASA. Retrieved October 13, 2015. ↑ Consolidated Launch Manifest NASA. Retrieved October 13, 2015. ↑ Space Shuttle Mission Archives NASA. Retrieved October 13, 2015. ↑ NASA's Shuttle and Rocket Launch Schedule NASA. Retrieved October 13, 2015. ↑ John Pike, Space Shuttle may continue through next year – Roscosmos Globalsecurity.org, May 13, 2010. Retrieved October 13, 2015. ↑ "Rare Four-Member Crew to Fly Final Shuttle". FoxNews.com, July 3, 2011. Retrieved October 13, 2015. ↑ Launch and Landing NASA. Retrieved October 13, 2015. NASA Space Shuttle News Reference - 1981 (PDF document). 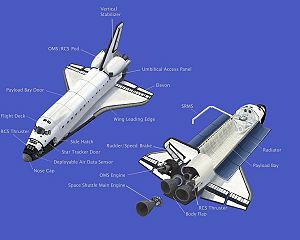 Lecture Series on the Space Shuttle from MIT OpenCourseWare. Space Shuttle Emergency Landing Sites. This page was last modified on 13 October 2015, at 21:39.